“What we strive for on stage is truth – finding a way to present something that is authentic,” proclaims Jonathan K. Waller, Managing Director of Everyman Theatre in Baltimore. That sense of authenticity reached new heights in Everyman’s production of Tribes in 2014, where a deaf actor portrayed Billy, a deaf protagonist, in a coming-of-age story about being deaf in a hearing world. Notably, the show came to represent a coming-of-age for the Theatre itself and an opportunity for them to reach new audiences. 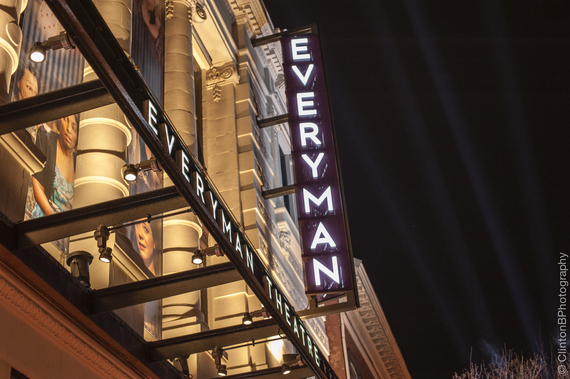 Founded in 1990, Everyman Theatre has grown significantly over the past decade. In 2012 Everyman moved from an old converted bowling alley on Charles Street to the Bromo Tower Arts & Entertainment District. Today, the Theatre brings six productions to nearly 50,000 patrons each year. Amidst this tremendous growth, however, Everyman remains deeply rooted in Baltimore’s local landscape: they employ a professional, equity-level resident company of actors who live in City neighborhoods, who send their children to neighborhood schools, and who are very much a part of the fabric of the community. For a number of years, Everyman experimented with ways to better serve deaf and hard-of-hearing patrons. Providing live sign language interpretation for select performances and investigating full service captioning for the entire theatre were two such options. As a small, local theatre company, the challenge became finding a more permanent and sustainable solution. Everyman leveraged the production of Tribes to do just that. With a discretionary grant from the Knott Foundation and support from individual donors, the Theatre licensed cutting edge closed-captioning software, purchased 20 iPod touch devices, and began offering closed-captioning for all theatre performances. “Closed captioning is definitely a game changer in how numerous people can experience live theatre, whether they are deaf or hard-of-hearing,” states Waller. Patrons now have a direct experience with the actors, instead of having to rely on an interpreter who is often positioned away from the main action of the stage. And Everyman’s commitment goes beyond technology to encompass staffing, training, and culture shifts. For example, an employee has been added to the Theatre’s production staff exclusively to operate the captions during each performance, and the Theatre teamed up with the Hearing and Speech Agency to help train house staff on basic sign language skills. In the meantime, Everyman Theatre continues to bring truth to the stage. The only difference is more people are able to join in that experience.